* price per person, based on 2 people sharing a room. Single supplement, if applicable: £520. Prices do not include flights. UK and US citizens will need a visa to travel to Iran (cost of the visa not included in the tour price). UK citizens will have to travel to London to obtain it in person and we can give full advice on how to obtain this. Note that for travellers in the US, this can only be obtained in person from Washington DC. The flight we are recommending for this tour is the BA flight departing London in the evening. After a long flight, we arrive in Tehran in the early hours of the morning. We travel into the city and check into our hotel. There will be a chance for some rest before we head out. In the afternoon, we visit the Golestan Palace originally built by Fath-Ali Shah of the Qajar Dynasty in the 18th century nowadays housing the museum complex. We also visit the marble Throne Hall, the Ethnographic museum and the Shams-ol-Emareh building and there is an opprotunity to walk around the garden to enjoy the tile-covered walls. We start with a visit to the superb collection in the National Archaeological museum of Iran. Highlights include fragments of pottery dating back as far back as the 7th millenium BC and friezes from Persepolis. We also to visit the Carpet museum, the Abguineh (Glass and Ceramics) Museum and the extraordinary crown jewels. 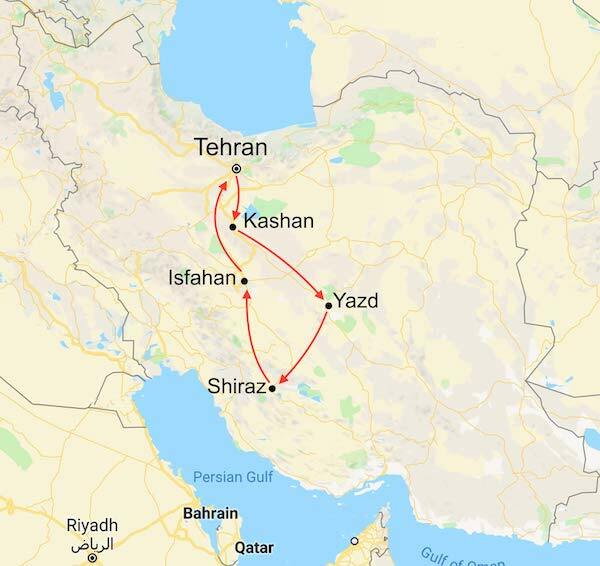 We depart from Tehran in the morning for Kashan. Arriving in the early afternoon, there is time to visit the splendid Bazaar during the afternoon. Evening meal and overnight near Kashan. 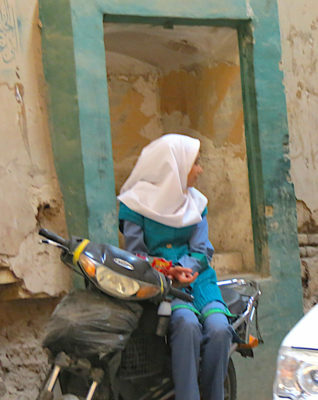 During the morning, we stroll through the relaxed atmosphere of Kashan. 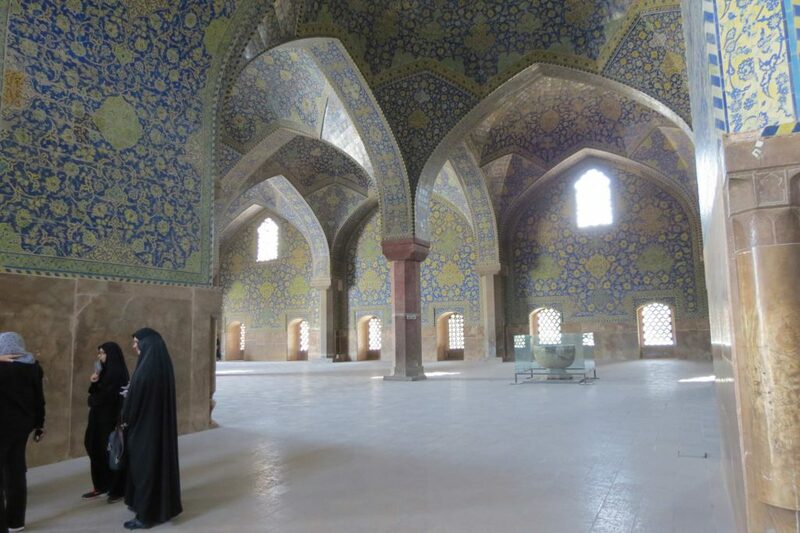 We visit the Agha-Bozorg Mosque – one of the best examples of Qajar-period mosques in Iran. We also visit two fine examples of 19th century merchant houses: the Taba-Tabai and Borujerdi Houses, with their beautiful stucco domes, inlaid mirror work and some of the best examples of existing badguirs (wind-catchers) in the area. Afer lunch, we travel onward to Yazd, passing through Naein with some intriguing handicraft stalls. Evening meal and overnight in Yazd. We enjoy a full day sightseeing in the newly listed UNESCO World Heritage Site – the Historic City of Yazd. It is renowned as being the centre for Iran’s small Zoroastrian community – and we visit the active Zoroastrian Fire Temple, the fire of which has been burning for about 1500 years. Among Yazd’s Islamic sites are the Friday Mosque (1324 A.D.) with the highest portal and minarets in Iran, and the Mirchachmagh Maidan and Mosque. Other notable Islamic monuments in the old Fahadan area of Yazd are the Seljuk shrine dedicated to the Twelve Shi’ite Imams and the Ziaieyeh Theological School known as Zendan-e-Eskander or “Alexandar’s Prison”. There are also many beautiful old houses in Yazd, among them another World Heritage Site, the Dowlat-Abad Persian Garden, with an 18th century feudal hexagonal house and the highest badguir (wind-catcher) in Iran. Finaly, we also visit one of the two Zoroastrian abandoned Towers of Silence (called a Dakhma), dating back to the 18th century and where, until some 50-60 years ago corpses were left on the platform to be picked clean by vultures. In the morning we depart Yazd for Shiraz. On the journey, we stop off at Abarkuh to see the “ice-houses” – extraordinary bee-hive like constructions where, in the middle of the dessert, in the past, ice was made and stored. En route to Shiraz we visit Pasargad – the site of the tomb of Cyrus the Great, the Founder of the Persian Empire. We also visit the remains of one of his palaces standing isolate on the vast plain of Dasht-e-Morghab. Evening meal and overnight in Shiraz. In the morning we make an excursion to Persepolis, one of the most important sites of the Ancient World. It was the ceremonial capital of the Achaemenid kings and boasts the remains of the palaces of Darius the Great, Xerxes and Artaxerxes as well as the famous bas-reliefs depicting kings and courtiers and gift-bearing representatives from all the nations of the Persian Empire. We also visit Naghsh-e-Rostam to see Ka’be-Zardosht (fire temple/ sanctuary) the Royal Tombs (also Achaemenid) and seven magnificent Sassanian rock-reliefs (including Shapur the First’s famous victory over Roman Emperor Valerian). We return to Shiraz to visit the tomb of Iran’s greatest lyric poets, Sa’adi and Hafez – both located in beautiful gardens. We drive to Isfahan – the 17th century capital of the Safavids and referred to as Nesf-e-Jahan (Half of the World) in Safavid sources – and on arrival there will be time to stroll to the river to see the famous bridges over the river. Today is a full day tour of the beautiful city of Isfahan. There is an opportunity to visit the very interesting Isfahan Music Museum and we also visit the Armenian Quarter including the important Cathedral of Vank. In the afternoon we visit one of the world’s grandest squares, the Maidan-e-Naghsh-e-Jahan. The square contains several important monuments: two of Islamic world’s greatest mosques – the Sheikh Lotfollah and the Imam – with its magnificent architecture and tile work and also the Ali-Qapu Palace with its enchanting music rooms and balcony overlooking the Maidan. There is time to stroll around the Maidan and visit the many handicraft shops. Evening meal and overnight stay in Isfahan. Today is another full day of sightseeing in Isfahan. It includes a visit to the magnificent Friday Mosque, with the famous Uljaitu Mihrab (Prayer Niche) of the Il-Khanid period. The Friday Mosque is considered a museum of a thousand years of Persian religious architecture and is truly one of the world’s greatest mosques. From here drive to the Chehel Sotun Palace, built by Shah Abbas II in the 17th century. Its twenty wooden columns reflected in the surface of the pool give rise to its name ‘The Palace of Forty Columns’. 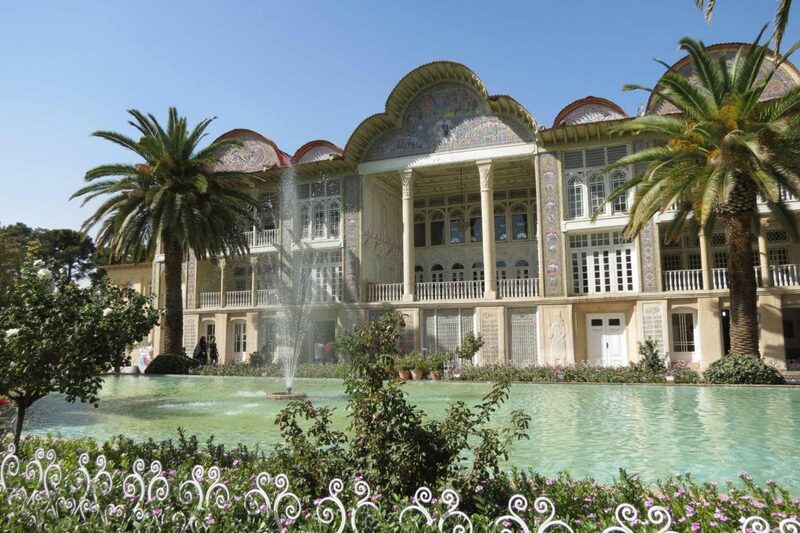 The next stop of the day is at the Hasht Behesht pavilion built in 1670 by Shah Solayman and known as the Pavilion of Eight Paradises or the Palace of Nightingales. This small but intricate building is set amongst tree-lined alleys, a reflecting pool and water rills. Finally, we return to the Meidan to visit the Qeisarieh Bazaar with hundreds of shops and workshops, displaying the arts and handicrafts for which Isfahan is world-famous. Evening meal and overnight in Isfahan. This morning there is an opportunity for shopping among the myriad handicraft stalls for some souvenirs to take back to England. Maybe you might like to buy some saffron? Or perhaps, if your, friends have more of a sweet tooth, you will buy them some gaz – delicious nougat often flavoured with pistachios. In the afternoon, we make the return journey to Tehran, staying the night south of the city in the airport hotel. Evening meal and overnight near Tehran. We are ideally placed to catch our morning flight back to London.